When I visit Washington, DC, I generally stay in the quiet, friendly, tree-lined neighborhood known as Southwest. It’s not the well-known Washington of stately neoclassic buildings, famous monuments, and cherry trees. Much of Southwest was wiped out by so-called urban renewal in the 1950s and 60s, when planners were in love with the idea of destroying the old-fashioned urban grid, with its pedestrians and human-scaled buildings and street life, and replacing it all with freeways, giant buildings, and parking lots. Such a freeway separates Southwest from the very heart of Washington — from the National Mall, in fact — and the result is incoherent and strange. The zone between Southwest and the Mall is a sort of demented, brutalist Radiant City gone dark. Buildings on stilts with highways running under them! Soulless, creepy zones devoted entirely to automobiles! More stilts on top of crumbling overpasses! … All within a few minutes’ stroll of the Smithsonian Castle, the other museums, and the Mall. It’s the result of a conscious decision by planners and politicians to favor the automobile over people — a bias that is still very much evident in the Washington metro area today. I hope that some of my future posts will examine the consequences of that decision. Fisherman’s Wharf is the heart of a highly successful and heavily used public space in Monterey, California. On a mild afternoon in February, the crowds were thick and cheerful. Unlike the wharf in San Francisco, this one actually has fishing boats nearby, and the restaurants serve a certain amount of fresh local seafood. The Wharf is just one feature along the Monterey Peninsula Recreational Trail, which runs for miles along the shoreline of the Monterey Bay. A very popular paved and accessible part of the trail connects the Wharf and downtown Monterey with the Monterey Bay Aquarium. The trail, a converted railroad line, is a great example of a public space that actually encourages public use. A wide variety of people of all ages and physical abilities were getting out and enjoying themselves along the shore of the beautiful Bay. We didn’t evolve to sit in cubicles. Every hour we spend staring at a screen, surrounded by beige walls and taupe carpet and khaki co-workers, is a stress. We need green, open spaces in which to momentarily reconnect with our primate selves. 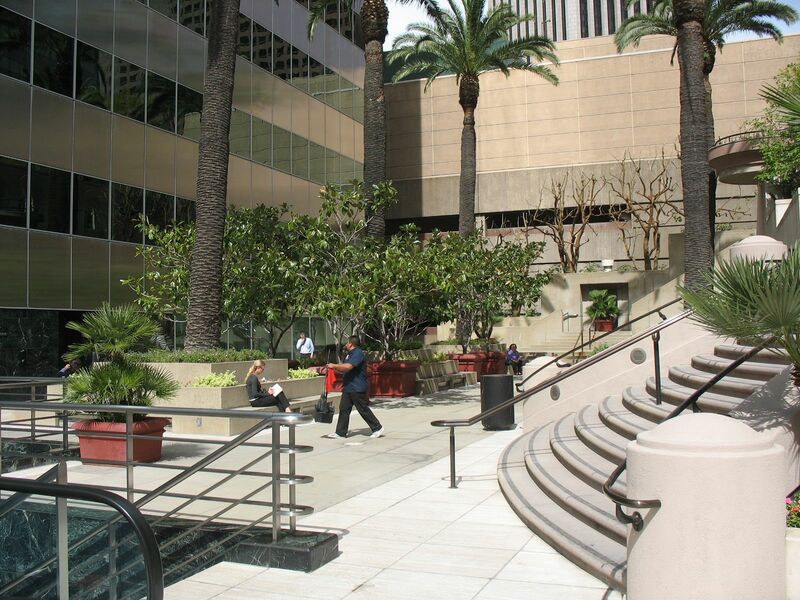 One of the more pleasant retreats for the office workers of downtown Los Angeles can be found at Citigroup Center, a the corner of West 5th and South Flower. 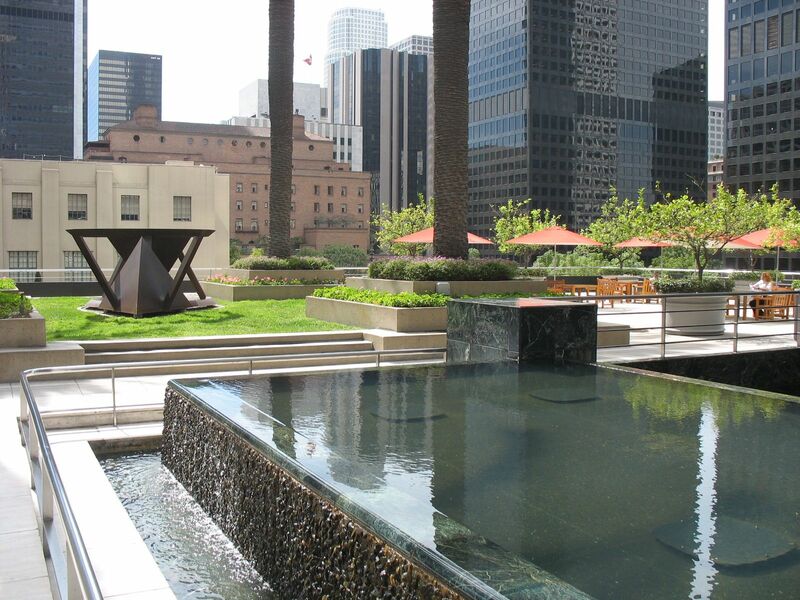 There’s a pleasant mix of open and closed spaces, closed corners and wide views, trees and sun. Plus the refreshing sight and sound of water. Follow the steps or escalator down, and you discover that it is in fact a waterfall. 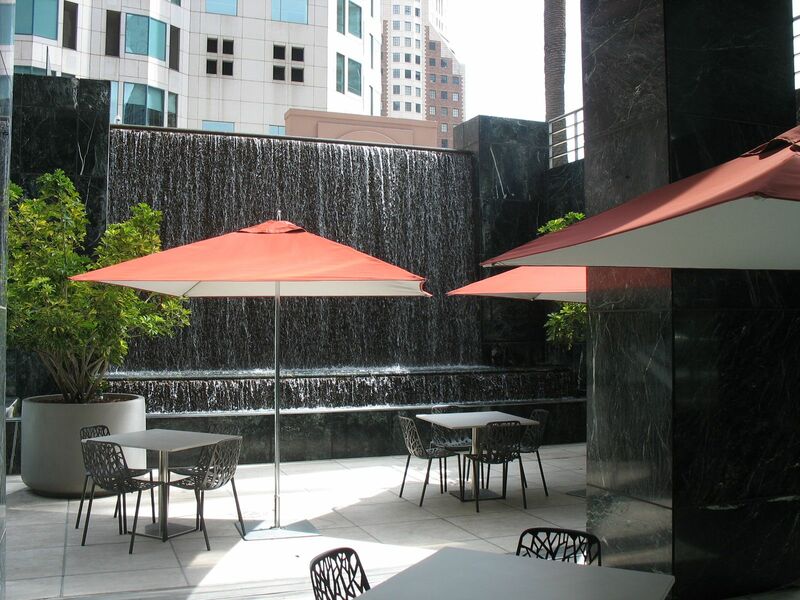 This area would be especially cool and refreshing on a hot, sunny, smoggy day. I like this space not because it is special, but simply because it’s an area of very expensive real estate that was creatively and thoughtfully designed to make people comfortable while they take a break from their jobs. Yes, legally mandated to be set aside for that purpose, I know – but better than it has to be. 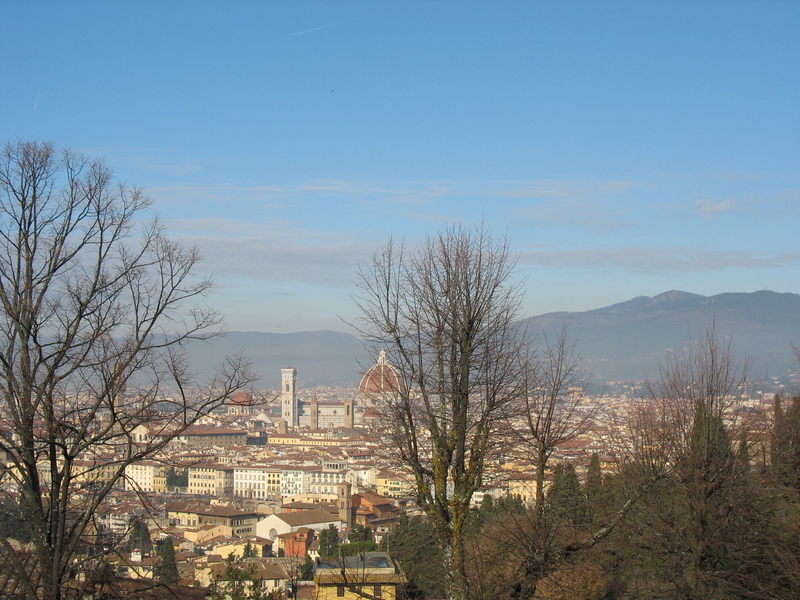 The historic Renaissance core of Florence, Italy looks much as it did in previous centuries. 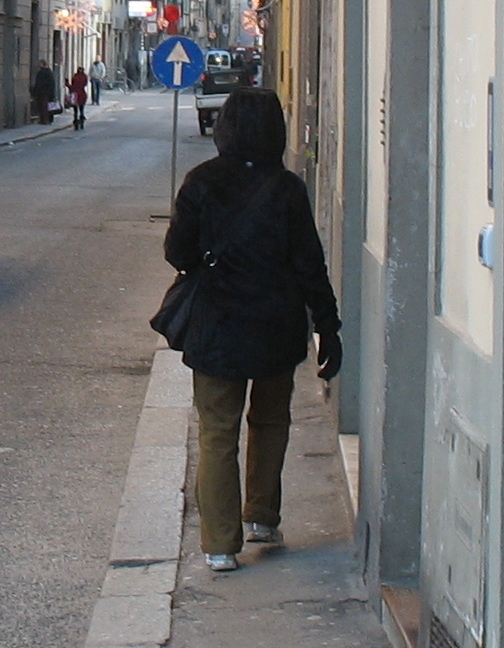 At street level, however, there is a problem: a city scaled for pedestrians, carts, and horses is filled with traffic. 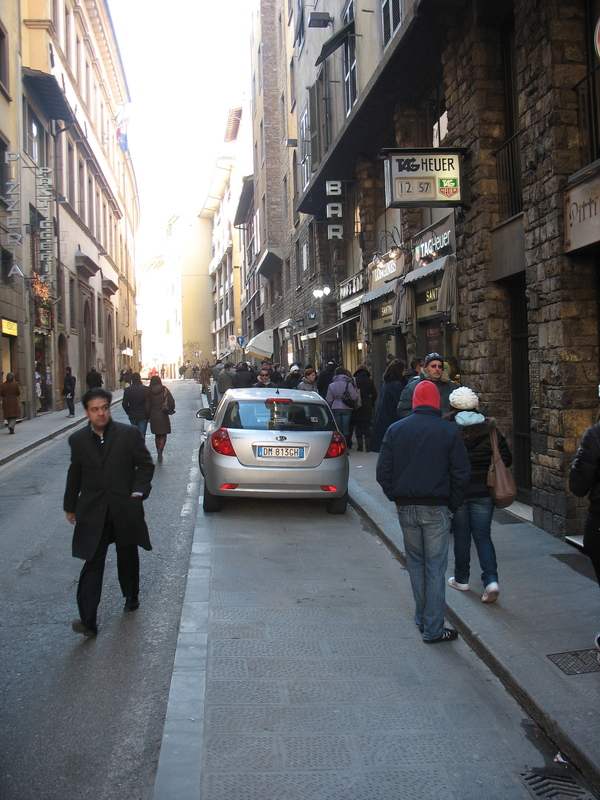 The result is that pedestrians and cars have to share space in a way that is not safe or convenient for either. 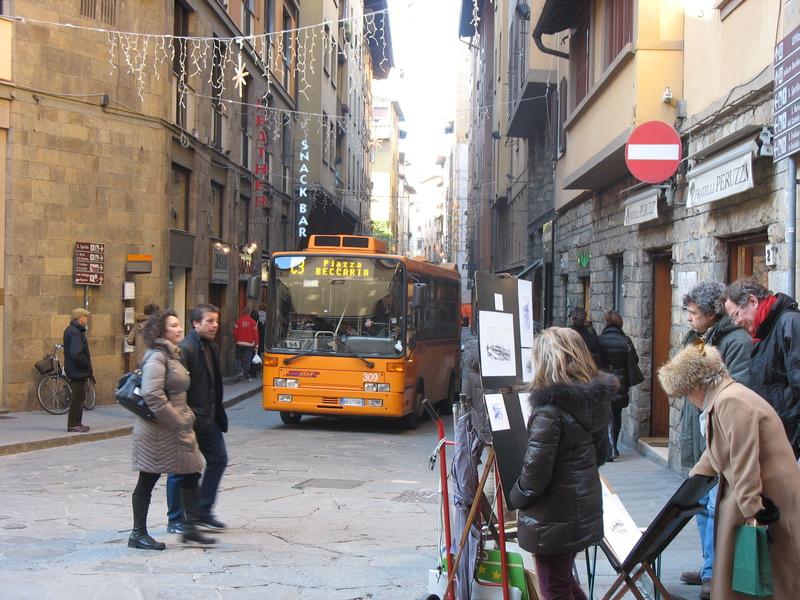 This was around late December or early January, when tourists are at a fairly low ebb. I can’t imagine the chaos of summer. You are currently browsing the archives for the Streets and sidewalks category.